"San Diego Vacations prompts a travel gift idea and a travel focused website too." Yes, I live in San Diego so you would expect me to invite you to this enjoyable Southern California destination. Even before moving here, I visited San Diego several times as a vacationer. 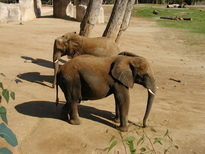 The world famous San Diego Zoo comes to my mind first and foremost as a reason to visit our city. Even as a child back in the early 1950's I remember my family coming across the desert from Yuma to San Diego. I wasn't very old and so my memories are sketchy except for visiting San Diego's famous zoo. Even now I can remember the various animal exhibits that impacted me a small child. Who would have ever guessed that I would eventually live here, joining those amazing elephants I saw at the zoo as a 4 year old as my preferred place to live. San Diego Beaches would be another reason people come here for San Diego vacations. Even as I focus on the beaches of San Diego, I can see that this short article will need to be developed into a full blown web page focusing on my amazing home town. Yes, the beaches you find in San Diego County are one of the key reasons for visiting the San Diego area. I am sure we found our way to the beaches on that first childhood visit but then again, we lived in Yuma, so maybe sunning ourselves on the beach just did not appeal to us. I can see that writing on the topic of San Diego Vacations is beginning to formulate a new website idea. Something along the lines of affordable destination vacations featuring travel ideas submitted by those living near popular vacation destinations. I guess it is time to explore Travel Destination Website Resources for ideas featuring affordable vacations. Join in and write your own page! It's easy to do. How? Simply click here to return to Best Family Vacation Story.